One of the primary reasons people give for not making changes to upgraded software solutions is the perceived hassles of the data migration/conversions process. 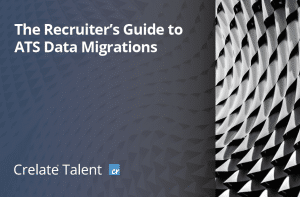 Get insider information on how to evaluate the efficiency of an Applicant Tracking Software’s approach to data migrations. You’ll be armed with the best and most up to date information to make sure your ATS migrates your data in the best way possible. What are the potential risks of data migration? What are the key questions you should use to qualify potential ATS vendors to assess their migration process? What does “fit” have to do with choosing a new ATS solution? What is the Data Migration Cost and the Migration ROI? Join over 900 staffing and recruiting agencies that improved their hiring efforts with Crelate.